The British National Party has slightly increased its share of the vote, but failed to take any seats. The party, which contested 119 seats, took 192,850 votes in total, compared with 47,129 at the 2001 election. Its overall vote share rose by 0.55% - its best result was in Barking, London, where it took 16.89% of the vote. There candidate Richard Barnbrook came a close third behind the Tories - the seat was won by Children's Minister Margaret Hodge for Labour. 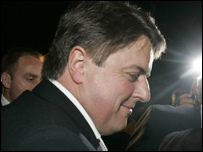 BNP leader Nick Griffin said he was delighted with his party's progress. He polled 4,240 votes in Keighley, West Yorkshire - 9.16% of the total cast. In Dewsbury, West Yorkshire, David Exley polled 5,066 votes (13.13%). The seat was won by Labour's Shahid Malik. In Rotherham BNP candidate Marlene Guest polled 1,986 - an increase of 7%, amounting to a 7% share of the votes. The party also scored 4% in Sunderland North, as well as in Sunderland South. The BNP's share of the UK vote was about 0.74% - below exit poll expectations of about 3%. It lost its £500 deposit in 84 seats, leaving it with a bill of about £42,000 overall. Mr Griffin, who came fourth in Keighley as Labour's Ann Cryer was elected, said smaller political groupings rarely did well in closely contested elections. Mrs Cryer said at the beginning of the campaign she was preaching a message of "Hope not hate". After being re-elected she said: "Hope has succeeded and hate has been defeated." Ms Cryer later claimed the BNP's presence in Keighley had damaged race relations. She said: "I am absolutely delighted that not only have I won but I have seen off the BNP who I hope won't return again. "I have a lot of work to do with my colleagues to repair race relations in Keighley." But Mr Griffin denied it had been a vicious campaign. He told Sky News: "It is a perfectly respectable base for us to go on next year to look at winning extra council seats." Mr Griffin told ITV News he had worn a bullet-proof vest during the campaign, after receiving death threats from Muslim extremists. The BNP's vote dropped dramatically in Oldham West, where they did well in 2001 when Mr Griffin was the candidate. This time, with Mr Griffin standing elsewhere, its vote fell by nearly 10 points to 7%. In Sunderland South David Guynan finished in fourth place up 2% from 2001 with 1,166 votes.